Now the men that love Bob’s Burgers can wear clean underwear because of this Bob’s Burgers 2 pairs of boxer briefs. The Bob’s Burgers underwear is made from 95% cotton and 5% spandex and come in sizes Small – 2XL. The first pair of Bob’s Burgers underwear in the set had has the heads of the whole Belcher family on it but with out the faces so basically just the hair and that looks fun as it is still clear that they are the favorite cartoon characters. The other pair is green and have many images of Kuchi Kopi on it and sure this not the nightlight from Louise but you can still sleep with having Kuchi Kopi near. 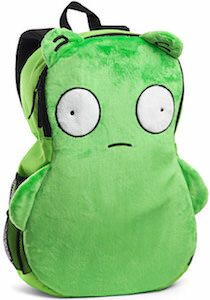 If you need a backpack and you like Louise from Bob’s Burgers then you should check out this Kuchi Kopi backpack. The backpack is green and shaped like Kuchi Kopi complete with little ears and arms. Now you can own this backpack that looks like the nightlight of Louise and this backpack is 19 x 13 x 5 inches and has a pocket on the side for a water bottle and inside you will find a laptop / tablet pocket too. Sure it does not look like most backpacks and that makes it so perfect for your as you have a mind of your own just like Louise. Bob’s Burgers fans can now have a fun Kuchi Kopi cookie jar. 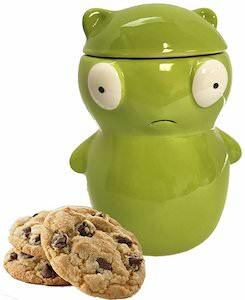 The Bob’s Burgers cookie jar looks just like the real Kuchi Kopi only this is a ceramic cookie jar shaped like the green creature and you can take the top of it off so that you can get to the cookies inside. Now you don’t have to finish all those cookies you bought or baked because you can store them inside Kuchi Kopi. I am sure that Louise would love to have this Bob’s Burgers cookie jar like this even though she prefers to finish all the cookies she can get her hands on. 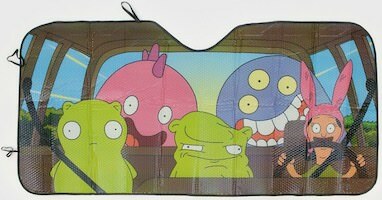 Bob’s Burgers can now have a Kuchi Kopi shower curtain. 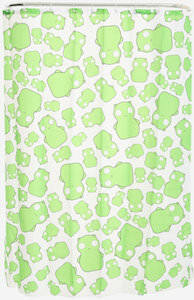 Kuchi Kopi is that fun green creature we have seen in different form in the Bob’s Burgers series and now there is a shower curtain that is fully covered in the tree creature and not just once but many many times. The Bob’s Burgers shower curtain is 70 x 72 inches and will look stunning in your shower as it is so much better then a boring plain shower curtain you can buy anywhere as this is a real fun looking shower curtain that brings color to every boring bathroom and it will make you smile every time you see it.